As the Countdown continues, I find myself feeling more and more eager to write the later entries (the top 10 or so), and resenting the earlier entries for “getting in my way.” But I made this bed for myself, and the shows to come deserve at least as much attention as those which I’ve covered thus far. So I’ll stop whining and soldier on, and hopefully get these posts out a bit quicker in the weeks to come. For those of you who followed along with the 100 Film Favorites Countdown in 2013, it should come as no surprise to see Mr. Bean pop up here. Bean: The Movie placed at #70 on that list, and I remarked that it would’ve scored far higher if not for the elements of “Americanization,” including the addition of frequent dialogue and the inessential family, particularly Peter MacNicol as the grating patriarch, David. Well, I might have been a bit hard on the movie. Though I’d had some exposure to the original television series previously, I must admit that I only sat down to watch full episodes of the show while revisiting it for this Countdown. And while Mr. Bean in its original incarnation is undoubtedly superior to its Hollywood interpretation, it’s still…missing something. Mr. Bean aired in 14 half-hour episodes over the course of 5 years, taking the tendency of British television toward short seasons to a ridiculous extreme. The series stars Rowan Atkinson as Bean, an eccentric, mostly silent man who’s a combination of Charlie Chaplin and Pee-Wee Herman, with just a dash of Mork from Ork thrown in. As I wrote in my review of the 1997 movie, the show follows Mr. Bean “bumbling from one surreal caper to another” as he goes about his day. Most of these misadventures stem from his apparent lack of understanding regarding social customs. He interacts with objects and other people in a peculiar way, and seems very isolated in his personal life. 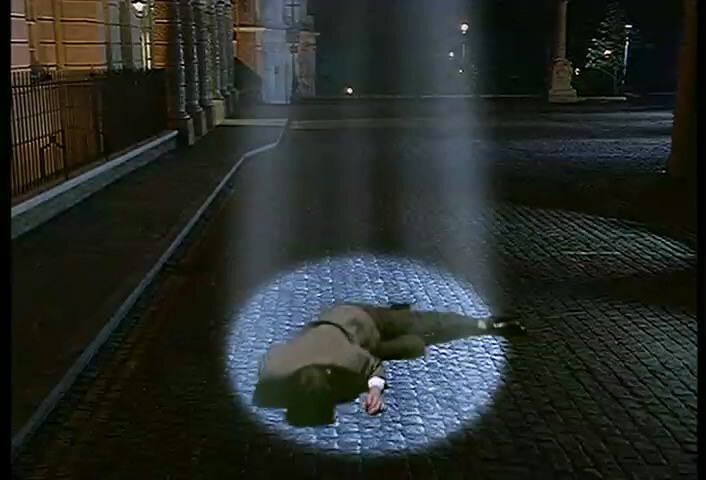 It’s no accident that each episode opens with Bean falling from the sky in a beam of light – the series is rife with suggestions that he might just be an alien, an idea which the subsequent animated series eventually confirmed. 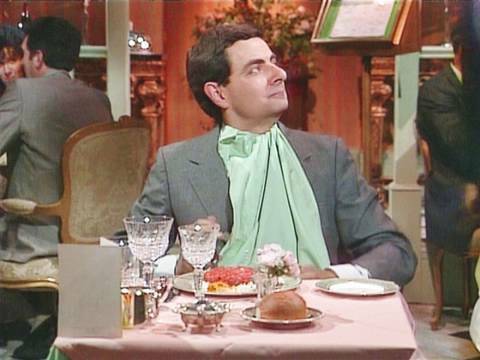 The greatest shining strength of Bean is the sheer comedic presence of Rowan Atkinson. The expressive power of his face and body language allows us to follow along with Bean’s thought process. Despite the quirky nature of his antics, this process is always distinctly logical. In one segment, he travels to the beach. He’s just about to change into his bathing suit when he suddenly discovers another, previously unseen beachgoer is sitting nearby. Embarrassed, Bean slowly begins to change into his trunks…without removing his pants. In another scene, Bean encounters a street musician. He stops, considering whether to toss some money in the performer’s case. He checks his wallet and finds a banknote, but tucks it away again…the performance isn’t worth that much. He rummages through his pockets, but finds no other money. Then, in a flash of Beany inspiration, he spreads his handkerchief out on the pavement beside him, and begins a “performance” of his own: a demented dance. An impressed passerby tosses Bean a coin…and Bean promptly drops it into the musician’s case and walks away. As in my post on the film, now comes the segment where I list the reasons Mr. Bean doesn’t rank higher on this countdown. First is an issue I’ll be covering in more depth when I get to another show further down the pipeline: the laugh track. Generally speaking, I don’t find laugh tracks as distracting or downright offensive as many internet commenters seem to. Certainly, recent series such as The Office and Arrested Development have more than proved that a laugh track is unnecessary to produce quality television comedy. But that doesn’t mean I can’t still appreciate older shows (or even some current shows) which retain the format. That said, Mr. Bean features a laugh track which IS alarmingly invasive, due to the simple fact that the series is essentially a silent film. And silent films, comedies included, flourished for decades without laugh tracks. Looking back now, the inclusion of the overbearing laugh track seems a baffling choice. But maybe the opposite was true in the early 90s (“Creating a TV comedy without a laugh track? How absurd!”). My second issue with the series isn’t so much a complaint as an observation. Each episode of Mr. Bean consists of a series of sketches, typically lacking an overarching narrative. Loathe as I am to admit it, I begin to see why the American filmmakers made some of the choices they did when bringing Bean to the big screen. A few comic setpieces do not a story make. But rather than the program itself, consider my ire aimed instead at the half-hour format. I first watched Mr. Bean in the food court of a local mall, and this simple change fixed both of my “problems” with the show. Sketches were presented independently, interspersed with ads. And because the TV screens were suspended on the walls high above diners’ heads, we couldn’t hear the obnoxious laugh track. The result was Bean bliss. If you’re looking to get into the show, I strongly recommend taking it in “food court”-sized chunks. Today’s “honorable mention” goes to another enduring Rowan Atkinson series which, while not as ingrained in my own memory, just might be the superior show. Blackadder refers to a string of four primarily independent installments (the British custom of calling television seasons “series” is particularly apt in this case) as well as several one-off specials. The show is unique in that each iteration takes place in a different period of English history. All are unified, however, by a handful of Back to the Future-style recurring characters. Each era features an Edmund Blackadder (Atkinson), a scheming man intent on heightening his social and financial status. And every Blackadder has a servant, the filthy “dogsbody” Baldrick (Tony Robinson). Alternatively aided and hindered by Baldrick’s “cunning plans,” Blackadder does what he can to outwit the vapid superiors to whom he must answer (Steven Fry, Hugh Laurie, and Tim McInnerny). The seasons proceed chronologically, and, in spite Edmund’s Machiavellian aims, the overall standing of the Blackadder family seems to decrease with time. In Series 1, The Black Adder, Edmund is a bumbling 15th-century prince, second son of the fictional King Richard IV. Over the course of the season, he plots to overthrow his brother and father and claim the throne for himself. He eventually succeeds, only to die almost immediately from drinking poisoned wine. 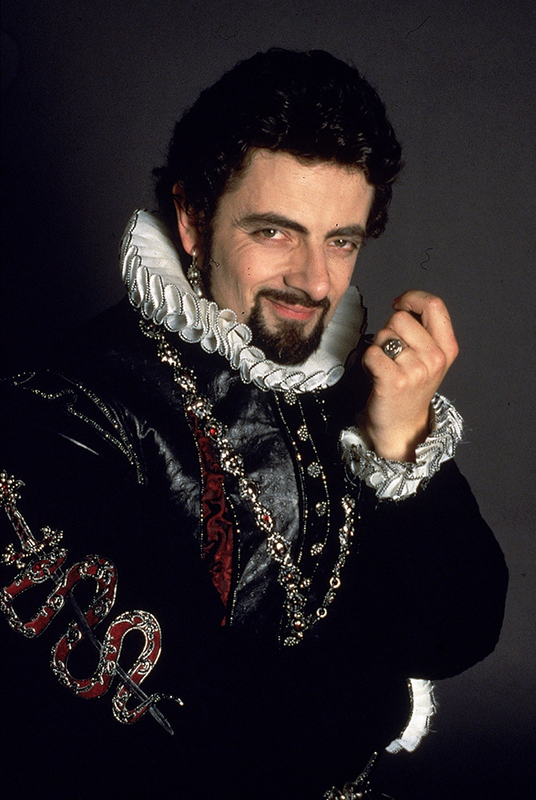 Blackadder II takes place in Elizabethan England, with Edmund now an English lord. Elizabeth herself, played by a pre-”Merlin” Miranda Richardson, is a prominent character is the series, and Blackadder strives to curry the impulsive monarch’s favor, vying for this dubious honor against Melchett (Fry), the Queen’s Lord Chamberlain. The Blackadder of this era displays a very different personality from his predecessor. Whereas “Prince Edmund” was stupid and clumsy, “Lord Blackadder” is witty, calculating, and outwardly charming. The new characterization resulted from a change in writing staff, and would remain the iconic Blackadder persona for all remaining installments of the franchise. Probably the sexiest face Rowan Atkinson is capable of making. Blackadder the Third sees Edmund reduced to the status of royal butler to the Prince Regent George IV, who ruled in his father King George III’s stead during the early 19th century. Blackadder retains his second season role as the “smartest person in the room,” scheming and wisecracking as he must reluctantly serve the foppish and airheaded Prince George (Hugh Laurie, in an almost startlingly silly role for those Americans who know him primarily as House). Blackadder Goes Forth jumps ahead to the trenches of World War I. Now, Blackadder is an army captain. Rather than to become or outsmart royalty, this Blackadder simply wants to escape the trenches and his seemingly inevitable death. The Captain and his troops are commanded by one General Melchett (Fry again), who issues his orders from the safety of a French castle some thirty miles behind the front lines. If you couldn’t tell, this series is a hair more dark and satirical than the first three. In fact, the finale episode, “Goodbyeee…,” ends with Blackadder and his company charging “over the top” for an offensive into no-man’s land. As they rush toward the sound of enemy gunfire, the footage becomes slow-motion, then dissolves to a silent shot of a former battlefield now covered with poppies. Many critics have ranked “Goodbyeee…” as one of the greatest television episodes of all time. In addition to the four main series, the Blackadder saga is rounded out by a couple standalone specials. The 1988 holiday special Blackadder’s Christmas Carol stars Atkinson as the Victorian-era Ebenezer Blackadder. In contrast to his Dickensian counterpart, as well as most of his own family members, this Blackadder begins the story as “the nicest man in London.” After repeatedly being taken advantage of and played for a fool, Ebenezer realizes that “bad guys have all the fun,” and that only through returning to its roots as nasty schemers will his family ever find success. Everything came to a grandiose end in Blackadder: Back & Forth, a finale/reunion special released at the turn of the new millennium. The special reunites all the recurring cast more than a decade after Goes Forth, and this is truly a send-off for the ages. For the first time, the story takes place in the present. 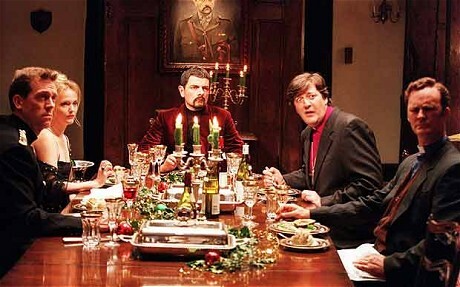 Modern-day Blackadder is once again a lord, and the special opens with him throwing a dinner party for his posh friends, George (Laurie), Melchett (Fry), Darling (McInnerny), and “Queenie” (Miranda Richardson). Blackadder unveils a mock time machine to his friends, and bets them that he can traverse time and return with an historical item of their choosing. His plan is to use a few props to convince his still none-too-bright friends and earn a quick buck. This falls apart, however, when Blackadder discovers that the time machine (constructed by Baldrick) actually works, though the two of them have no way of controlling precisely when it’s heading. Thus, Baldrick and Blackadder pop from one era to another, exploring many periods fans of the series hadn’t yet seen (the Napoleonic Wars, Robin Hood, the ancient Roman conquest of Britain), as well as a few they had (Miranda Richardson reprises her role as Elizabeth I, in a scene which also allows Blackadder to lambaste Shakespeare for forcing his flowery prose on untold centuries of high school students). Along the way, the time travelers disastrously distort history. Though they do manage to frantically restore the “proper” timeline, Blackadder ultimately decides that the ability to change the past has its advantages. In the end scene, he returns to the present with his royal heritage finally restored. King Edmund, now married to Kate Moss, is the ruler of England at last, and must only answer to his Prime Minister…Baldrick. 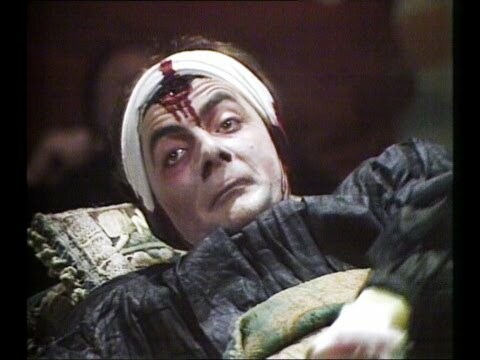 Though some of the gags are hit-and-miss for me, Blackadder as a whole is impressively ambitious, and even epic. How many TV series can you name that span a millennium? In addition to the recurring actors / characters, the various series share a common theme song, though it changes slightly to reflect the musical stylings of each series’ respective era (Harpsichords in the Regency era, for instance, and a military band for the WWI chapter). It’s a dang catchy tune, and that final rendition at the end of Back & Forth, with lyrics celebrating Blackadder’s ultimate triumph, is downright moving. “Let joy fill every Briton’s heart! For now, our country’s going to make it! At last, a king who looks the part! At last, a queen who looks good naked! So there you have it. Two sitcoms, each remarkable in its own way One a refreshing revival of silent-era slapstick, and the other a banter-packed jaunt through history. If you don’t like one, maybe you’ll like the other. Or perhaps, like me, you’ll enjoy both. 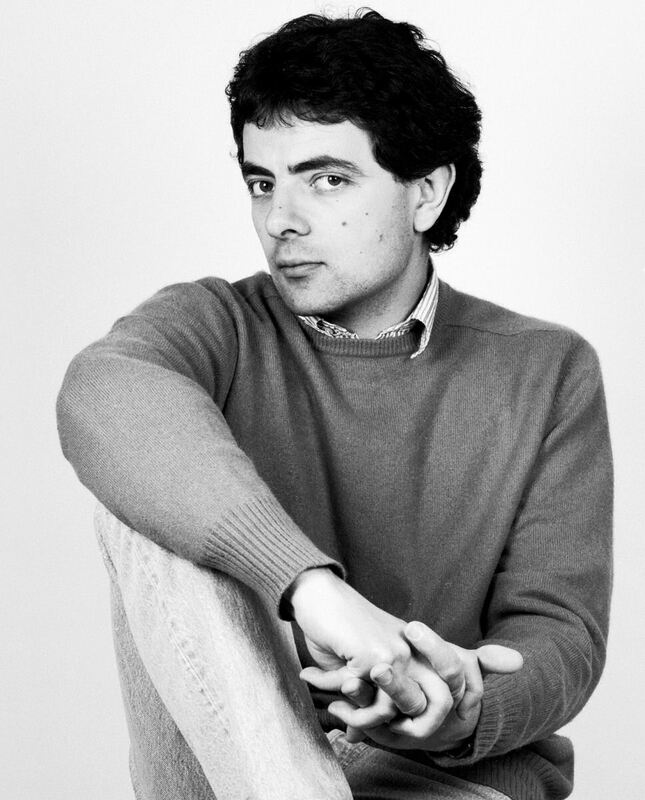 What it all boils down to is whether or not you want to hear Rowan Atkinson talk. P.S. : I promise this will be the last twofer for 20 posts or so to come. Oh, and I was wrong…he CAN make sexier faces.